Important: These are not plans for making this yourself. These are the directions that came with this trick when it was on the market for $395.00. This PDF is designed for collectors who may have the prop, but no directions, magic historians, and those simply curious as to how this trick was done. The trick still shows up on eBay, magic flea markets and auctions. If you need the directions, then here they are. 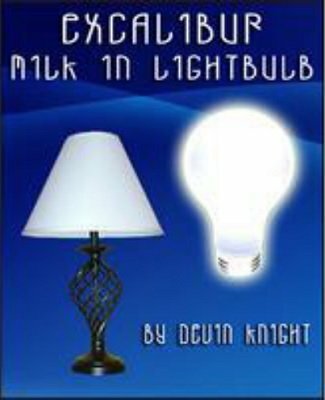 One of the most impossible and classiest milk in light bulb effects you will ever see. The base is spiral and see-through so there appears to be no place to hide a gimmick. The effect is simple. Turn the lamp on and then vanish milk, salt or a white silk. The moment the object vanishes the lamp goes out by itself. The magician need not be near the lamp when this happens. Remove the shade and unscrew the bulb. Inside the bulb is the vanished milk, salt or silk! The milk or salt is poured out leaving you with just an empty clear bulb. You do this without the need of any off stage assistants. Magician is in full control of the lamp even though away from it. Designed for the professional, this prop will add class to your act. Strong enough to close your show and an effect seldom seen nowadays.